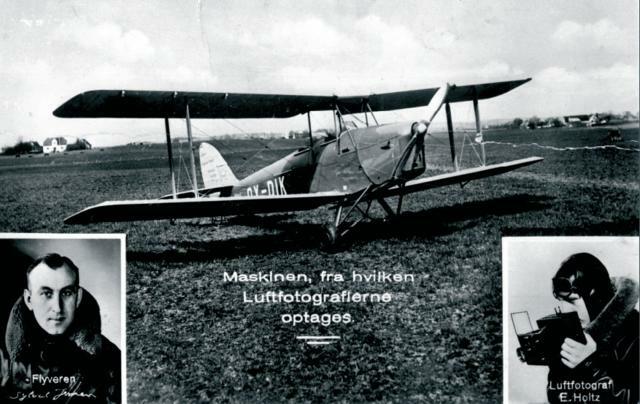 Viggo Sylvest Jensens Flying Circus performed aerobatic tricks that would have stood the test of time. Most of the tricks were very dangerous, and most of these tricks would be banned at airshows today. The question on everybody’s lips at the time was: Is it a publicity stunt, or simply a way to make money? I won’t go into that, but instead present some of the stunts and how they did it. 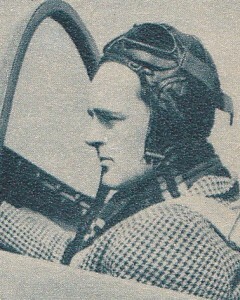 The stunt pilot, Peter Steen, had a career in the British R.A.F. during the war and was well versed in patern and stunt flying. Sylvest Jensen had a KZ-VIII acrobatics plane build for this purpose. This stunt had been performed in the US for years. Viggo Sylvest Jensen used a KZ-III with a modified top. 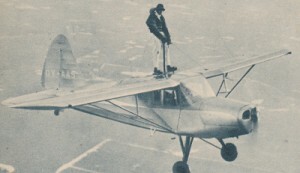 A hatch behind the wing was inserted into the aircraft to that Palle Johnson, the acrobat, could get out on the wing. He then climbed out, holding on to a metal pole while the pilot flew around. 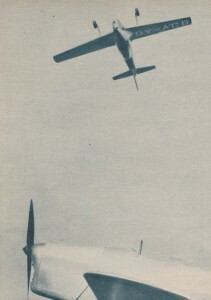 A hankerchief placed 20 cm off the ground was picked up by a hook on the wing-tip of the KZ-III. The pilot, Svend Sørensen, would fly at 100 km/h and suddently tip the wing down, just before, and pick up the handkerchief. A miss would have meant instant death! 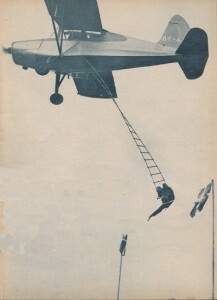 A rope ladder was lowered from the modified KZ-III, and Palle Johnson would climb down the ladder, hang upside down, and then pick up a rope with a flag at each end, while flying at low altitude. 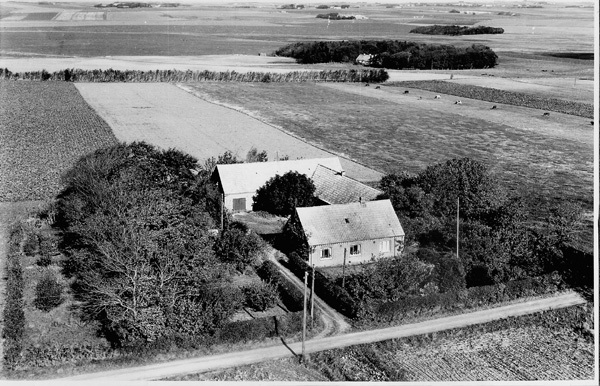 The pilot was unable to see the ladder and Palle Johnson, and he was directed from a radio-truck on the ground. I have found this video clip from 1950, with comments by Gunnar ‘Nu’ Hansen, showing most of the stunts being performed. 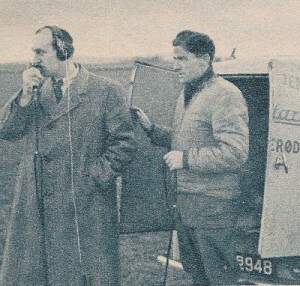 Viggo himself on the left, directing the aircraft from the ground. Peter Steen – Ex. Royal Air Force. 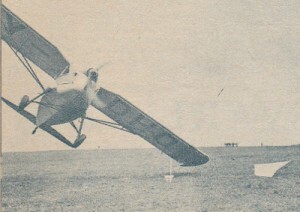 Stunt-pilot of KZ-VIII. Palle Johnson – Wing-Walker and trapeeze artist. 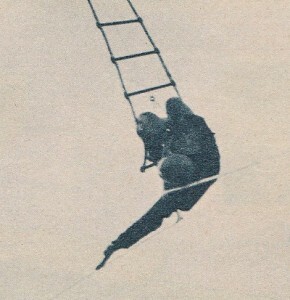 Ewald Holst – Pilot on the Rope-ladder stunt (no photo).